The low-profile unit on right is only 2.62 inches high, top to bottom! 4-dog, center cam actuation. Clamping pressure across 4 points of contact. Center cam, when not engaged, pops up as visual indicator that hatch is not secured. When engaged, cam unit is completely flush – no snags. Each Baier Low Profile hatch assembly also includes an optional Drive Adapter puck which converts the hexagonal drive so hatch can be operated with any standard half inch (12.7mm) socket drive. 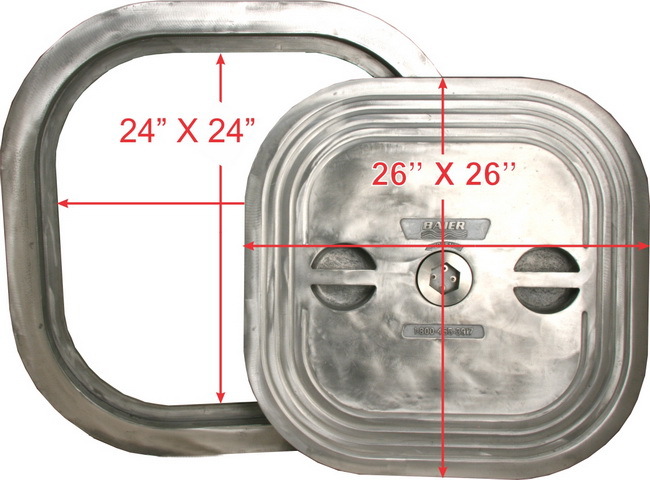 Currently, the 4-dog BFHLP series hatch cover assemblies are available only in cast aluminum. However, the deck rings for the BFHLP are the same size as the Strongback models, and are available in galvanized mild steel or cast aluminum. Stainless Steel deck rings are available by special order. Baier low profile hatches are designed for applications where inside clearance is limited. Built strong for the extreme rugged requirements of the commercial and fast utility craft worldwide. Ring Material: cast aluminum, galvanized steel, or stainless steel.